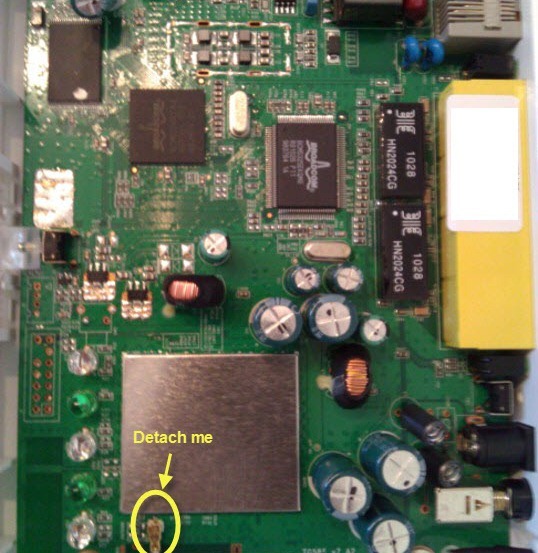 A long, long time ago, in a blog post far, far away, I documented some of my home tech in a piece that described how it all connected together. The article actually focused on my home network equipment, but I figured it would be useful to document the rest of the kit so that I can look back on it in a few years and marvel at how outdated it all was. In a move which is hopefully slightly more interesting than my outrageously poor opening line, I figured it would be fun to expand out and showcase how I actually use some of this technology in my day job and my home life because I enjoy reading about the interesting things others have done, so perhaps others out there will appreciate this! Our apartment is cabled using gigabit ethernet, with at least two outlets in each bedroom plus four in my home office, and four in the living room behind the TV. This all terminates back to a Conectix Home Network Patch Panel which provides 8 termination points for each of the sockets, plus 4 telecoms connections which can be used to route the BT line to any of the RJ45 outlets scattered around. The network sockets all terminate back to a Netgear GS605 Unmanaged Gigabit Ethernet Switch, which sits inside my Connectix Home Network Cabinet. I really like having the flexibility to swap-out any active hardware or install new stuff without any hassle, plus having the freedom to route connectivity about as I need it is pretty neat. 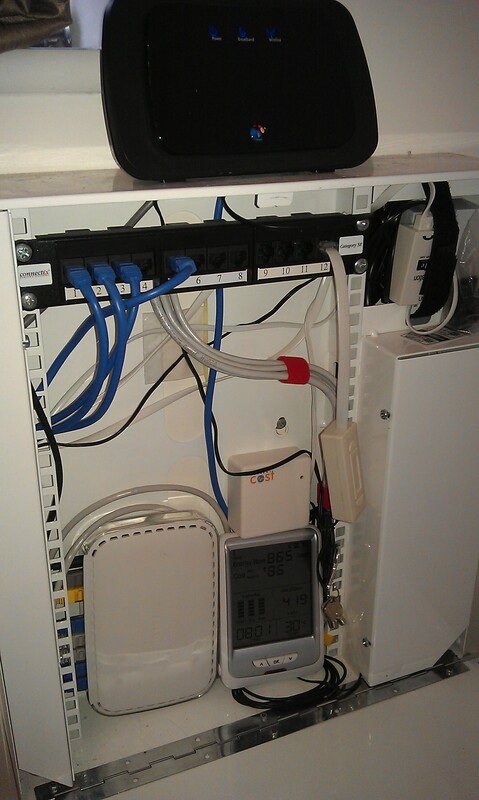 Within the network cabinet is a Current Cost Envi and Current Cost Bridge, although I have to say that I am not overly impressed with the bridge’s capabilities since it connects only to the my.currentcost.com web site, which although powered by Pachube, locks all your data away. In the coming months, I will hopefully be announcing my revised ‘Arduinometer’ project, which is now based on the new Netduino Plus. This open-source platform will be capable of reading simultaneously from different energy meters, including gas, electricity and water. 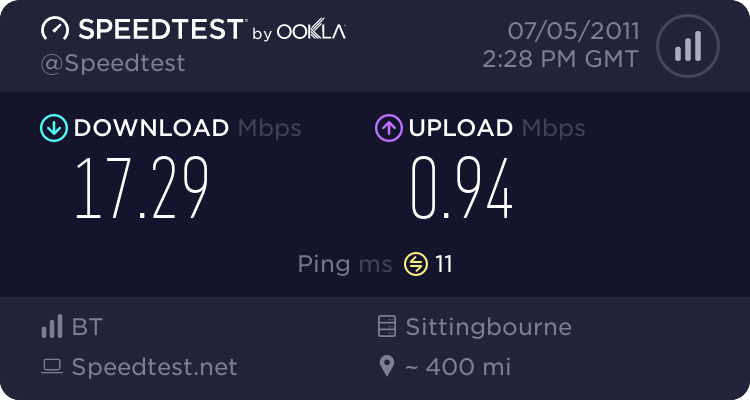 What matters most to me is reliability: as I work from home, I need a robust connection that’s there when I need it. At the heart of my home network is a new HP ProLiant MicroServer N36L with 4TB of storage capacity. It runs the newest Windows Home Server 2011 operating system. All my client PCs (including my main development station) are backed-up daily by the server. That makes for a total of 4 PCs and 1 laptop being regularly backed up by the server, quietly and transparently. As an added bonus, after a clean build of my development station, I took a full backup of it and that should allow me to do a complete rebuild simply by restoring the backup (which is actually an image of my machine) to go back to my ‘ideal state’ at any point in time. My main development machine is an Intel Core i7 870 @ 2.93GHz. It has 8GB of Corsair DDR3 RAM and runs Windows 7 Ultimate. I’ve fitted out the very lovely Antec P90 case with a Corsair sealed liquid-cooling unit for keeping the processor nice and cool. Having a nice big radiator and 12cm fan means the RPMs can be kept low and that in turn reduces noise from the case. Storage wise, I’m running a 120GB OCZ Colossus SSD as my primary drive with a 600GB Western Digital Green Caviar for storing most of the data. I also have a secondary 60GB Corsair SSD which has holds code I’m working on with Visual Studio 2010 (which, by the way, is installed on my primary SSD). Driven by the NVidia GeForce GTX 275 primary graphics card are two 24″ LCD monitors, but I have aspirations to update those this year to a couple of IIyama 27″ panels. I also have a cheaper standard graphics card driving a 3rd 21″ CTX LCD monitor on which Twitter sits (yes, it is an addiction – live with it). 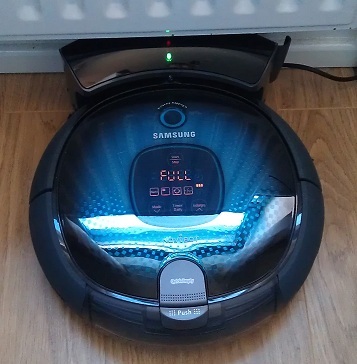 Yesterday, after spending a few hours researching, I made a little bit of an impulse decision and purchased a Samsung Navibot SR855 (a robotic vacuum cleaner). I figured that since I don’t like hoovering (and neither does my girlfriend), this could be the ‘ultimate’ gadget purchase that both of us can enjoy. Needless to say, at £338, my girlfriend wasn’t particularly impressed when I first broke the news. Naturally, the first thing you have to do after any impulse purchase is convince other people that you had a good reason for doing so, and that what you’ve bought will actually be suitable. At least, someone with my reputation for buying just about anything that has a plug on it has to anyway! Hoovering isn’t a particularly fun chore, and with two cats and hardwood flooring everywhere, this is a task we have to repeat fairly often. The Samsung Navibot SR8855 comes with an on-board scheduling feature which means you can program it to wake up daily and go to work. Potentially, this could save us 20 minutes per day and over a full week, that’s over two hours – a full five days a year! Having just spent the morning assembling IKEA flat-pack furniture, the floors were covered with sawdust and other general packaging mess. Plus, a few days’ worth of cat fluff. It was time to put the Navibot to work. After charging for 90 minutes (the unit is supplied at an almost empty charge), you simply press the “auto” button on the Navibot and it undocks itself and starts mapping your room. I chose the Navibot, rather than it’s main competitor the ‘Roomba’ from iRobot, because it appears to follow a much more logical pattern when cleaning your rooms than the Roomba does, which seems to do most of its navigation by bumping into things. The Navibot has an upward-facing cameara which continuously takes pictures of your ceiling to determine the layout of your room, in connection with some distance ranging and kinetic sensors mounted on the first 180 degrees of the unit. In just a minute or two it appeared to have figured out exactly where it was, and started linearly moving backward and forward around the room picking up cat fluff and sawdust neatly over every section it covered. As I mentioned above, we don’t have carpet, and I imagine the Navibot wouldn’t perform very well at all on those. Being very quiet, it clearly doesn’t have a lot of power and relies mainly on the two counter-rotating triple-brush ‘arms’ at the front of the unit to guide surface dust and fluff into the main brushes at the rear of the unit, rather than using vast amounts of suction. In our front room, however, there is a fairly thick rug. It seems to navigate over it just fine initially, but it is a bit too thick for the unit to comfortably turn and it makes all manner of struggling sounds as it tries to desperately back away to firmer ground. My verdict would be to avoid this if you have a carpeted house as it’ll only really pick up loose surface fluff and small debris. If you have hard flooring though, this thing is awesome! It cleaned our entire apartment, minus bathrooms, in approximately 20 minutes. The dust container was pretty full of all the usual things, indicating that it’d done quite a good job. In ‘auto’ mode, Navibot is apparently ‘afraid’ of walls, so it leaves about a 5cm margin around each wall where it doesn’t clean very effectively, relying instead on the exterior brushes to try to reach corner dust. It does, however, have an ‘edge’ mode, which you can run a few times per week if you want. I suspect with a few uses it will get slightly more efficient at navigation, particularly since I couldn’t help myself from tinkering with its ‘manual mode’ occasionally, which lets you take control using the remote. Once in manual mode, however, the unit stops remembering the route back to the charging dock, so you have to manually steer it back (if you ask it to return to dock on its own, it will fail miserably). On full auto though, it navigates back just fine. Overall, I am pleased to say that this is one household gadget I’ve purchased that is actually pretty good at its job. Plus, my better half is also happy with the purchase, too – so it’s win/win. Having been programmed to wake up every morning at 6am and go to work, by the end of the week we should still have a cat-fluff and dust free floor area throughout our apartment. And neither of us will have lifted a finger. No doubt I’ll be tweeting updates on the #navibot so follow me for the latest! In this post, I will show you how to dismantle your Thomson SpeedTouch TG585 v7 router to allow connection of an external WiFi antenna. This is a very simple process requiring the removal of only four screws. 1 x Mini PCI U.FL to RP-SMA Pigtail Cable (~£1.50 each, I bought mine off eBay from this seller). 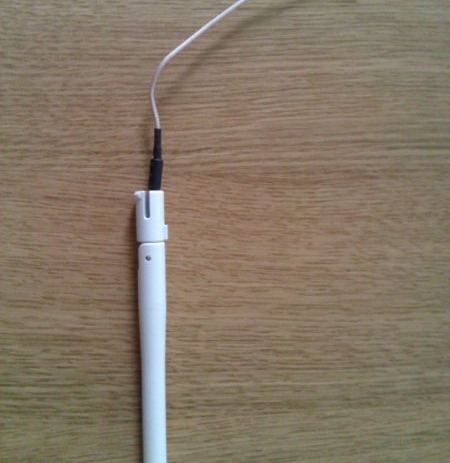 … The external antenna you want to use! (I purchased this one for £13.99 from Maplin as it has a magnetic base, useful in my particular installation). 1. Disconnect the power to your router, and unplug the power adapter from the mains supply. 2. Flip your router over, and remove the four plastic feet/pads from each of the four corners of the router. 3. Underneath the feet are four screws (one underneath each of the pads). Unscrew each one. 4. Lift the router off the table and gently give the base a tap – the grey top section should fall off. That’s the ‘lid’. If it doesn’t come off easily, gently prise it off with a flat head screwdriver; the operative word being gently. It’s not glued or wedged, it just might be a little tight. 5. Turn the unit over so you can see the main board. You might find a pair of needle nose pliers may help – but the clip is not particular tight or difficult to remove so just be wary of applying excessive force. 7. Now, thread your new antenna pigtail cable through the case (where the old antenna used to go) so that the tiny clip is on the inside and the antenna connector (the larger connector) is on the outside. Connect the small end to the main board of the router in the same place you disconnected the old one from. 8. Pop the lid back in to place, turn the unit over and put the screws back in, followed by the sticky feet. 9. Now connect up your external antenna, and you’re all set. For those of you who don’t know, I’m currently building a new high specification PC to handle the day-to-day rigours of software development. Like a lot of developers, I’ve decided to embrace the new SSD drive technology due to the massive performance increase to be had over traditional ‘plate drives’. I’ll provide more details about the PC’s specification soon, but I wanted to share some information about the various ways in which SSDs can be configured and how they affect performance. There are plenty of articles out there regarding SSD design, from a technical point of view, but I haven’t found any that have compared AHCI to IDE so that I could figure out which might give my Colossus the best chance of performing well. So, I decided to run my own basic test. For this test, I am using the Intel DP55KG motherboard running BIOS version KGIBX10J.86A (17th Feb 2010). The DP55KG has 8 on-board SATA ports, six of which are powered via the board’s PCH, and two via an integrated Marvell 88E6145 chip (check out this post for an excellent review of the DP55KG). 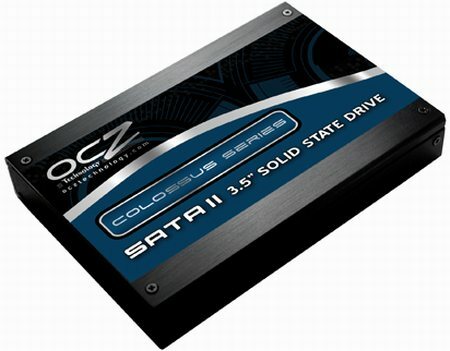 The drive under scrutiny here will be the OCZ Colossus 120GB. On paper, according to OCZ, the drive supports read and write speeds up to 260MB/sec, with sustained write around 140MB/s. This was the best drive I could find of this capacity in the price bracket. I wanted to know, “Which performs better, AHCI or IDE?” followed by “will IDE mode on the Marvell chip out perform IDE mode on the Intel PCH controller?”. To find out, I will use Passmark Performancetest 7.0 from Passmark. 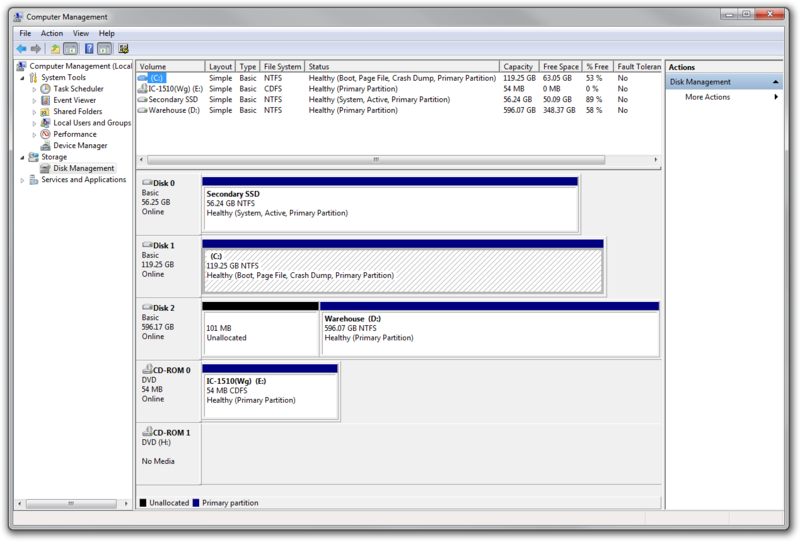 It provides a simple, standardised means of testing my SSD’s. Repeat these steps, but next time configure the controller in AHCI mode. Please note: in the results above, “This computer” refers to Intel PCH in IDE mode. Based on the information above, for three identical Windows 7 installations on the same test PC, the result is fairly obvious: the Marvell controller won’t get you very good disk performance. Use ports 1 to 6 on the Intel DP55KG instead. IDE mode seems to outperform AHCI, if only marginally. Having read various articles on the topic, I know it is unusual for anyone to actually experience the quoted performance speeds of the manufacturers. In this instance, though, I’m curious to learn if there’s anything else I can do to get closer to those, as in my tests – for sequential reads, for instnace – I’m well over 150MB/s slower than the manufacturer’s quoted speed (albeit still way faster than most 7,200RPM SATA “Plate” drives). I’ll continue reading to see what else I can do but for now, at least, I’m happy with the added performance benefit and satisfied that I’ve chosen the best mode and chipset for my system.